Spacious room in an Art Deco style - Queen size bed - Living room - Reversible air-conditioning - Internet access Wi-Fi - Antique wardrobe - Bathroom with shower. From Wednesday 1 May 2019 until Saturday 31 August 2019: Enjoy 15 % off! Deluxe room in mezzanine - Queen size bed - Living room - Reversible air-conditioning - Internet access Wi-Fi - Antique wardrobe - Bathroom with shower. Spacious suite - King size bed - Living room - Satellite TV - Reversible air-conditioning - Internet access Wi-Fi - Antique wardrobe - Bathroom with bathtub. 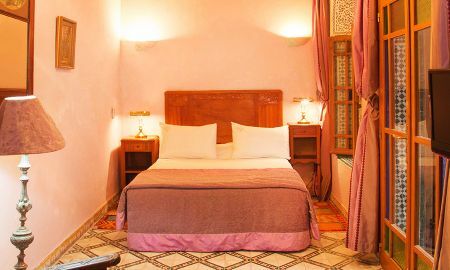 Located in the heart of the city of Rabat, only a couple of minutes from the « Rue des Consuls » and the Kasbah of the Oudayas, Dar El Kebira is above all a guest house made to welcome its visitors offering them quietness and well being, within the traditional district of Rabat. The slightest details are conceived to create an environment reflecting luxury and refinement. 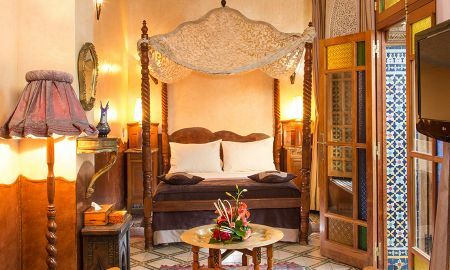 Dar El Kebira is a work of art from the Arab-Andalusian architecture, restored and converted to meet the costumer's top-of-the-range demands. Like the tradition of big riads, Dar el Kebira articulates around a patio that is open to the sky. 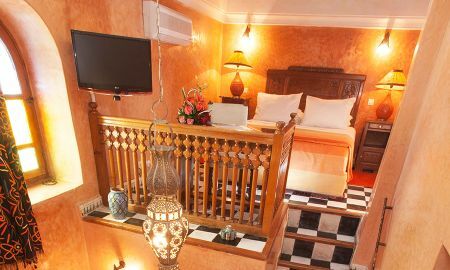 You can relax near the fireplace in the Moroccan living rooms; you can relax near the fireplace, oriented and decorated in zellige and mosaic, drink mint tea near the fountain of the patio or simply skim through the collection of book put at your disposal. Dar el Kebira is ideally located, in the heart of the city of Rabat, only meters from the road to the Consulates and the Kasbah des Ouadyas.